This this world-famous arrangement by Praetorius of a well known Christmas carol has been transcribed for cello quartet. Arranged in F major, it can be transposed up a whole tone to G major or a down a fourth to C major depending on the players’ abilities. Es ist ein Ros entsprungen, most commonly translated to English as Lo, How a Rose E'er Blooming or A Spotless Rose, is a Christmas carol and Marian Hymn of German origin. The piece first appeared in print in the late 16th century, and the text is thought to be written by an anonymous author. Both Catholics and Protestants have used the hymn, with the focus of the song being Mary or Jesus, respectively. In addition, there have been numerous versions of the hymn with varying texts and lengths. The tune most popular today appears in the Speyer Hymnal (printed in Cologne in 1599), and German composer Michael Praetorius wrote the harmonization in 1609. The tune was used by Brahms as the inspiration for a chorale fantasy for organ. 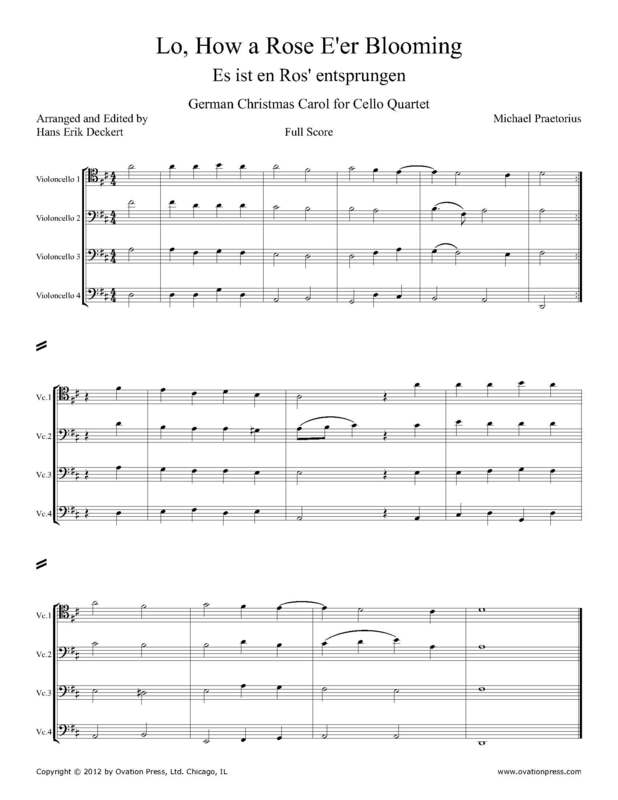 The carol was later transcribed for orchestra by Erich Leinsdorf and Hugo Distler and used as the basis for his 1933 oratorio Weihnachtsgeschichte ("Christmas story"). Und bleib ein reine Magd. or: Welches uns selig macht. or: Who makes us blessed.